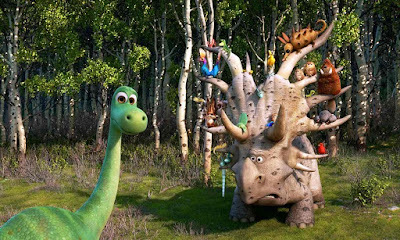 THE GOOD DINOSAUR is a woeful entry into the Pixar animation catalogue, beset by differences of opinion and multiple directors, and emerging with no clear authorial voice. The resulting film ends up as a deeply trite coming of age film with little humour or emotional pull. Indeed, it's only truly original or clever conceit is to have the hero dinosaur befriend a young Neanderthal kid called Spot as a human might befriend a puppy. After an early Lion King inspired loss of a father, the dino, Arlo, has to journey home with his mute sidekick Spot, in order to prove his courage to his dead father. The antagonist is nature itself, which seems clever, but really just creates a narrative void at the centre of the film. The voice-work is lacklustre with the exception of a typically charismatic cameo by Sam Elliott as a gruff but lovely T-rex. The animation of the landscape is photo-real and gorgeous but jars against the cheap-simplistic artistic choice to have Arlo be a green shiny kids toy. One to avoid - even on DVD. THE GOOD DINOSAUR is rated PG and has a running time of 93 minutes. The movie is on global release.